Wine and chocolate are basically the star-crossed lovers of the food world. No one wants them to be together, they damage each other, and their union is destined to end badly. 1. Match weight with weight: if your chocolate is really rich, you'll need a rich wine (like malmsey Madeira or tawny Port) to match. Lighter styles can get away with slightly lighter wines. 2. If you're having salted chocolate (apparently this trend isn't over yet) make sure your wine has low tannin. 3. Big-flavoured chocolate (infused with things like ginger, rose etc) will probably taste best with an equally flavoursome wine. 4. Generally-speaking (i.e if you don't have time to faff) a sweet, fortified wine will work well. Why? Low tannins, good acidity to cut through the wine, sweetness to match the chocolate, and a smoother texture to match the mouth-coating texture of chocolate. 5. If you don't like the wine, don't bother. Even if it's a textbook match for your chocolate of choice, it won't magically make the wine likeable if it's not to your taste. This, to all intents and purposes, shouldn't bloody work. It's light in alcohol, it's only mildly sweet, and it's fizzy, none of which tends to lend itself well to big, bold chocolate. However, we tried it with Brix: a chocolate made specifically to match wine. You can buy Brix from Wine Gift Centre (it's £7.99 for a big block) and it comes in various styles designed to match specific wines. That said, the best thing to do is experiment. I was surprised by how well it worked with the medium dark chocolate: it didn't really clash at all, but it did unfortunately kill off a fair bit of the Moscato's flavour. The Extra Dark was an even bigger surprise: okay, they aren't a match made in heaven, but they do sort of just let each other be, which is incredible for such different styles and characters. It also wasn't too bad with white chocolate, as long as you pick one that isn't too vanilla-packed. We had a sweet Gewurztraminer from Alsace, which really shouldn't work with chocolate: it's not sweet enough, it's got high acidity, and it smells like turkish delight. But we also had some ginger chocolate truffles. I'm not a massive fan of ginger and chocolate (these were pretty tasty) but when you sip some fragrant Gewurz with it, OH MY DAYS. Ginger is often found in eastern Asian cuisine of course, and Gewurz is often quoted as the perfect match, and it sort of works in the same way here. Oh, Ravenswood, how I love thee. But you're not generally chocolate's bestie. With the Extra Dark Brix, however, it was incredibly moreish: although I personally would prefer to drink Ravenswood on its own, if you're looking for a red wine and chocolate match, you can't go far wrong. Also lovely with cherry liqueur chocolates. Not surprisingly, this works well with various chocolatey treats (I especially liked it with a chunk of fruit and nut), but it made hazelnut praline particularly creamy. Dreamy. I've always loved sweet madeira and chocolate. 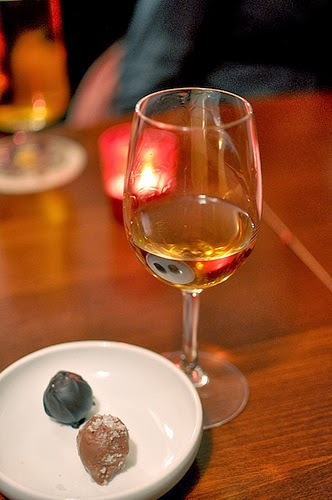 We tried H&H's Malvasia, and it was a match made in heaven for most of the chocolates we tried. I preferred white chocolate with madeira rather than port, but two of the matches really stood out: it cut through the cloying nature of the hazelnut praline divinely, but OH MY does it do a Crunchy proud! You get a wonderful, decadent, burnt-caramel flavour that blew my mind. Have you been sipping wine and nibbling chocolate recently? Tell us your fave matches below! Try an aleatico from apuglia with some valrhona manjari chocolate. Ooh, thanks grazza! I definitely will look out for that!